Who does't love happy hour? Cheap drinks, sometimes cheap food. But most of the time happy hour menu consists of only a handful of cocktails, which means limited options. Not so much at Melrose Umbrella Co. 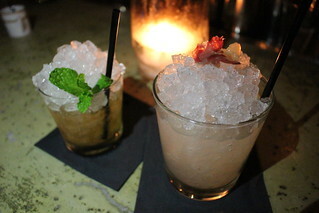 I've heard a lot of Melrose Umbrella Co before, for having good cocktails, so I was excited to come in for happy hour. 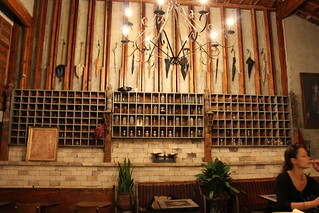 The decor is fun, and the name of the bar is actually related to an old photo of the great great great grandfather of one of the three bartenders who started Melrose Umbrella Co. You'll see vintage umbrellas along with vintage photos of the family around the bar. OK, back to happy hour. At first glance the happy hour menu looks small, with a punch that serves 4 and 4 sections of cocktails. 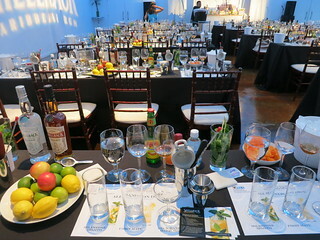 But the last section actually covers the four classic cocktail families with your choice of garnish and base spirit. Virtually unlimited choices! 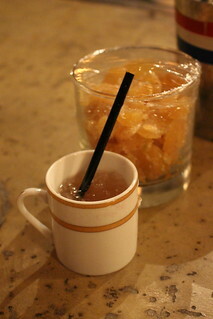 First off, they served us a mini cup of the white sangria to start off the night (and "amuse booze"). This is the same sangria that comes as a 4-person punch and it is a crowd pleaser. Let's start off with some of the happy our choices. There's the Nip Julep made with bourbon, mint, and peach, and only $5! The last section lets you choose between the four cocktail families: smash, fix, daisy, or maid. The "Fix" is your choice of base spirit with citrus, sugar, and your choice of garnish (I did bourbon and grapes). The Smash would be like a mojito with any spirit, and the Maid is made with cucumber, mint, and and citrus. Each is $9. A Shellbacker is someone who's crossed the equator. 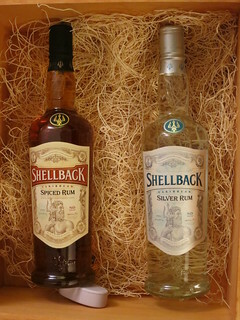 Shellback is also the name of a rum made in Barbados, claimed to be the birth place of rum according to the oldest document found thus far documenting rum being made (from 1651). They're one of the affordable rums (about $15 a bottle) and come in both silver and spiced rum. They had sent me a box containing both of them and while the rum is affordable, they sure sent them in a fancy box with my name engraved on it! The silver rum was pretty smooth and they both make good mixing rums. 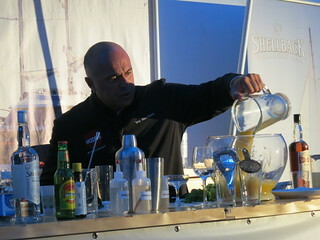 I didn't know what to make with them though (other than the classic rum cocktails that I usually drink), so when I was invited to a tasting and mixology workshop with Tony Abou-Ganim, the Modern Mixologist, I figured it's a great chance to get some creative recipes. Before making cocktails, we had to learn how to properly taste rum. Tony told us to put our nose in the glass but breathe through the mouth. Then we rinse the mouth with the rum itself. We get a saliva drip in the back of the mouth which is a good indication of acidity. As I said when I tasted it at home, the rum is pretty smooth. Barbados style rum is unique in Caribbean because it is a blend of pot stilled and column still. The silver rum tasted of burnt sugar, honey, banana, vanilla, and caramel. The spiced rum had seven natural spices added: Vanilla, nutmeg, cloves, allspice, cinnamon, cassia, ginger. 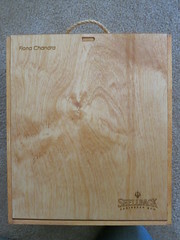 It has the aroma of caramel butterscotch and is rich with a luscious mouthfeel. It's hot as it runs down your throat. There's a bit of acidity and a lingering finish but it's a clean finish. Now, on to cocktails! He gave us three recipes.